The Normandie Impressioniste Festival also includes an exhibition at the Musee des Beaux Arts in Rouen called DAZZLING REFLECTIONS. The lovely painting by Camille Pissarro pictured here is NOT included in the exhibition, although it would have been a fitting addition. (This is the Pissarro that comes immediately to mind when it comes to reflections.) Perhaps they felt this would intrude on the Pissarro exhibition in Le Havre. Instead, much of the exhibition are early paintings of Monet and it concludes, predictably, with a few of his waterlilies. The most striking Monet is a very large canvas taken up primarily by dark blue water with only a few streaks to show movement on the surface. Far in the upper right corner is a small boat with its end extending into the water. The exhibition also includes a large number of Sisley paintings, which put the “dazzling” in the reflections. One interesting painting is of a regatta on the Thames River, the wind throwing the sails and flags on the boats into a colorful flurry. The MUST-DO of this exhibition is in a small room in the second section, which places four renditions of Sisley’s true masterpiece, “The Inundation at Marly,” side-by-side. One of the paintings is from the Rouen museum’s collection. To its right is a similar painting of the same scene from the National Gallery in Washington. There are two other paintings of that same scene. It’s just a guess on my part, but I suspect that this may be the first time these four paintings have been seen together. In the first section, the Rouen museum pairs its lovely Berthe Morisot painting from Nice with a similar painting, also from Nice, borrowed from the Dallas Museum of Art. A very thoughtful pairing and a real treat. The BIG SURPRISE was the large number of Caillebottes. Most of us know that he was an avid sailor, so it’s no surprise that he would also paint sailboats. However, we are much more familiar with the realistic paintings of Caillebotte, Rainy Day in Paris from the Art Institute, Chicago, and the one of men stripping old paint off the floors, the vegetable market, and the lovely gardens of his home. The paintings of sailboats and water are much looser, more Impressionistic with sparkling water and shimmering skies, not what we are used to from Caillebottte but throughly delightful. Sadly, the galleries at the Rouen exhibition were sparsely populated, in stark contrast to the galleries of three years ago which were packed. The Pissarro exhibition at Le Havre was well-attended, with jockeying for views of paintings. The Signac exhibition at Giverny also had full galleries, and attendance at the Caen exhibition was also good. 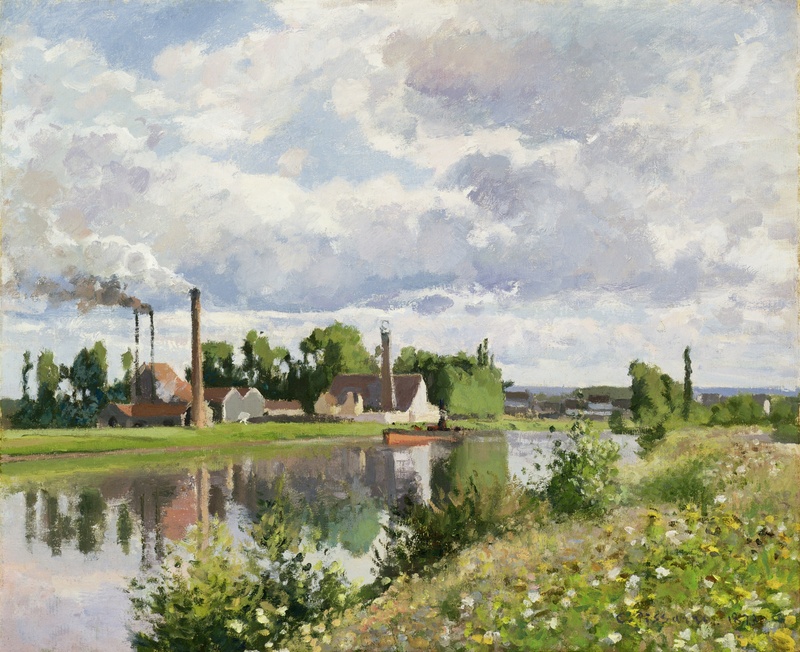 Perhaps the Rouen exhibition will pick up speed as the Normandie Impressioniste Festivale winds its way through the summer.